Hooray for Heather and Brian! While they are off enjoying their honeymoon I thought it would be fitting if I talked about beauty trends. Trends come and go. They're never meant to be taken so seriously (i.e. clean out your entire wardrobe every season) but simply to help you experiment maybe discover new you love. 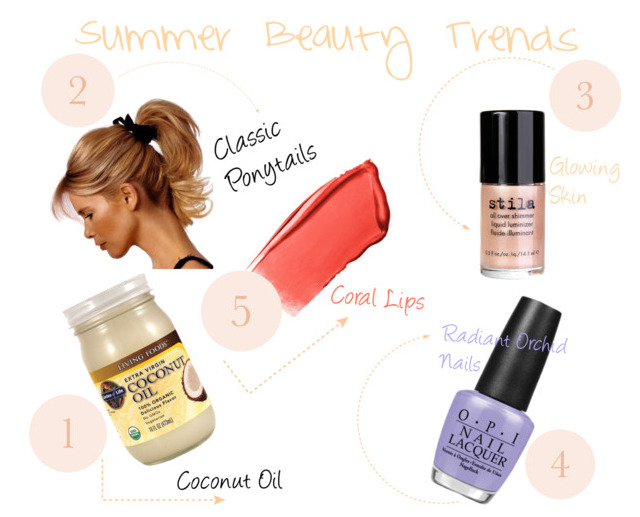 Here are 5 beauty trends I'll be sporting this summer season, who's with me? 1. Coconut oil. I've been using Coconut Oil for many things including oil pulling. There are so many uses it for it and you can find it at your local grocery store. 2. Ponytails. I'm looking forward to ditching the braids and sporting the classic ponytail this summer. I may even add some accessories! 3. Glowing skin. I have fair skin so I often find bronzer looks odd on me. So I've become a fan of these "luminizers" where you mix it with your foundation to give you a glow. Stila has a great option. 4. Radiant Orchid. Pantone declared Radiant Orchid the color of 2014. I think it's a gorgeous color and see myself rocking it on my nails. OPI's "You're Such a Budapest" is a great option. 5. Coral lips. I think every girl can pull off a coral lip... you just have to be bold enough to do so. You can opt for a lightly tinted lip balm or go for a full fledge lipstick. What summer beauty trends are you loving? I like that nail polish color. Also, I'd like to try a coral lip but I'm still searching for the right shade. Hope you find it! Perhaps more of that dollar brand you lucked out on? love love love, ponytails, coconut, coral lippy, perfect! Thanks :) What's your favorite coral lip color?